Low Impact Transportation: Thailand has lots of options for getting around making less of an impact. We always try to use local transport. This trip gives you the chance to try out the public buses, overnight sleeper trains to go from Bangkok to Chang Mai in the north of Thailand and of course the famous Tuk Tuks, cycle rickshaws, longboats and Songtoews. Getting around as the locals do not only allows you to experience the culture on a deeper level, but the same way it is at home, using public transport is the most sustainable way to go – after walking and cycling of course! Protecting Nature & Wildlife: Visiting national parks is an important way to contribute to conservation because entrance fees are the core method of funding many parks, from maintenance to security and protection from poaching. Visitors help the parks to pay staff and keep the park protected. We take a bus to the Khao Sok National Park and stay in simple, yet comfortable, fan cooled bungalow style rooms (fans are a much better alternative to energy-draining air conditioning!). 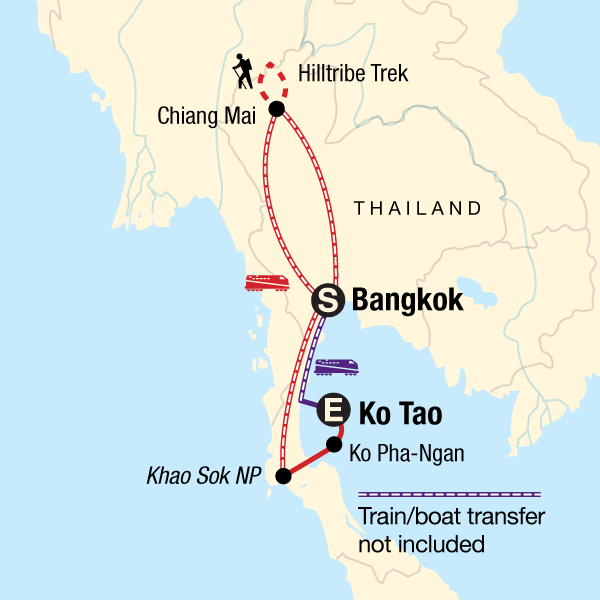 This trip gives you the option to explore the Khao Sok National Park which covers an area of 739km2. Thanks to other protected areas (Klong Saers and Khlong Nakha) next to Khao Sok, the actual protected area measures almost 4000 km2. The dominant forest is lowland rainforest and is about 160 million years old, which makes it older than the Amazon! Supporting local culture and businesses: There are a multitude of opportunities to support local businesses and immerse yourself in Thai culture on this trip. From the colourful markets to the bustling food stalls and cafes, the choices for eating and handicrafts are endless and the money is staying in the local economy - a vital way for tourism to make a positive impact. Activities that take you to markets, locally-owned restaurants, community projects, NGOs, locals’ homes and villages are vital to the local peoples’ ability to truly benefit from tourism. People in rural communities, especially in developing countries, often lack access to the economy due to their location, lack of funds, or ability to market their products. Visitors offer them the chance to supplement their income whether it’s simply by buying handicrafts, staying overnight in someone’s home, eating a meal at a family-owned restaurant, this trip makes contributing to the local economy part of the adventure. Chang Mai is a centre of handicraft production, with a long history of silverwork, woodcarving, pottery-making and weaving. Not to be missed is the Night Bazaar, a series of covered markets, shops and stalls that offer the best selection of handicrafts in Thailand. Our style of trip, travelling, eating and staying with the locals, puts you right at the heart Thai culture. On this trip you get to experience first hand the cultural and religious differences between Northern and Southern Thailand. Homestay with Hill Tribe: This trip also allows you to further immerse yourself in the culture and support indigenous tribes on the hill tribe trek. We trek through Thai jungles and overnight in traditional hill tribe minorities in their basic bamboo huts, learning about their traditions, customs, and day-to-day life. There are plenty of chances for local interaction and the chance to support their work by purchasing local handicrafts. Their huts are very basic; this is a chance to experience extremely low-impact and natural living. Explore your spiritual side: An important Buddhist centre since the 14th century, Chiang Mai is home to more than 300 temples. Many visitors come here to attend meditation retreats, massage classes or yoga lessons. Other Activities to Support Development Initiatives in Thailand: Visit the centre for the disabled, visit a local leper colony, cycle through the countryside, eat at Cabbages and Condoms. Cabbages and Condoms is a restaurant (now a chain in Thailand) with a mission. Proceeds from the restaurant and adjoining gift shop which sells items made by local people are given to the Population and Community Development Association, a non-profit organization founded in 1974 which supports birth control, environmental conservation, rural development and AIDS awareness.